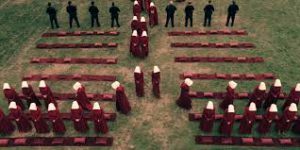 The Handmaid’s Tale by Margaret Atwood is a novel that has been developed in a first person view, which gives it a deeper and more personal feel overall. Upon reading the first few pages of the story, I couldn’t really get a good grip on what was going on, I believe it’s because of the lack of information given before I was introduced into the story. After getting through a few pages, I found myself unable to look away from the book. The unraveling of the mystery behind what I read in the beginning of the story kept me interested. In the beginning of the novel, a woman was introduced, who I believe is the protagonist. The protagonist and according to the story, several other women were kept inside of this house, as if they were prisoners but they were maids. “ In the semidarkness we could stretch out our arms when the Aunts weren’t looking, and touch each other’s hands across space ” (Atwood 4). The preceding quote was very shocking to me at first, because of my ignorance about the situation, but after reading it, I started to realize that these women were being treated harshly. They were deprived of even the basics of human interactions. These maids were being treated as inferior to the owners or occupants of the house, as in the commander, his wife, and the Aunts. There seems to be a lot of rules according to what I’ve read so far, which means there are consequences attached to those rules in case they’ve been broken. An example of such rules can be found in the following quote, “ We learned to lip read, our heads flat on the beds, turned sideways, watching each other’s mouths” (4). The preceding quote gives the reader hints about one of the rules in the house, which is no talking past bedtime. I thought that was unnecessary and somewhat controlling towards the maids. While I was reading a bit further into the story, I came upon certain moments that made me question the reason for the willingness of the maids to stay in that place. “ She probably longed to slap my face. They can hit us, there’s scriptural precedent. But not with any implement. Only with their hands” (16). The preceding quote is an example of how inhuman the maids were treated. The contents of that quote is one of the several reasons why I found myself questioning their willingness to remain in such a place. The following is a picture from the tv show based on the novel The Handmaid’s Tale. I came across some readers who translated the beginning of the story into something completely different from what I think it is. An example of that is suggesting that the maids are being treated so harshly because they are women and that the men are the ones doing it, as far as I’ve seen from chapters one and two, that statement is false. “ She wanted me to feel that I could not come into the house unless she said so” (13). The preceding quote shows that the commanders wife is using her authority to look down on and perhaps abuse the maids. Another example would be the Aunts, according to the following quote, they seems to be the ones enforcing the rules in the house, “ In the semidarkness we could stretch out our arms when the Aunts weren’t looking,” (4). The protagonist and the rest of the women were afraid to let the Aunts see them physically interacting, which says a lot about the Aunts control over them. This entry was posted in Parts I-II on November 2, 2017 by Jordan JP. I like that you’ve including an image in your post, but make sure to cite the source (the same way you would for a written text).